Home news President Trump says 'Only one thing will work' with N Korea. President Trump says 'Only one thing will work' with N Korea. 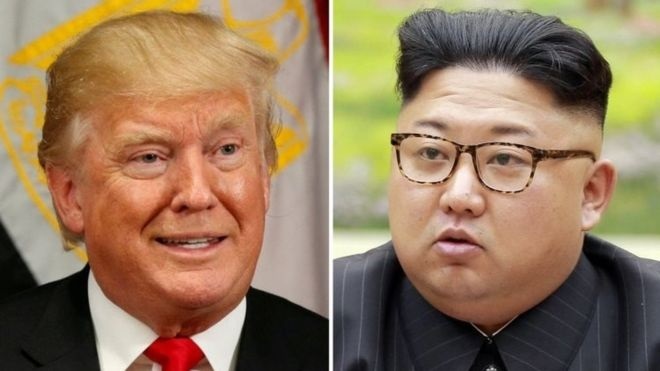 "Only one thing will work" in dealing with North Korea after years of talks with Pyongyang brought no results, US President Donald Trump has warned. "Presidents and their administrations have been talking to North Korea for 25 years," he tweeted, adding that this "hasn't worked". Mr Trump did not elaborate further. The two nations have been engaged in heated rhetoric over North Korea's nuclear activities, with the US pressing for a halt of missile tests. Pyongyang says it has recently successfully tested a miniaturised hydrogen bomb which could be loaded on to a long-range missile. President Trump has previously warned that the US could destroy North Korea if necessary to protect America's national interests and defend its allies in the region. Saturday's tweets are another cryptic announcement by America's leader, the BBC's Laura Bicker in Washington says. Last week, it was suggested that US Secretary of State Rex Tillerson had set up a direct line of communication with Pyongyang to try to resolve the escalating tensions. Mr Trump then tweeted: "Save your energy Rex, we'll do what has to be done!" The latest comment by the US president could just be bluster - but the fear is that Pyongyang will interpret it as a threat, our correspondent says. In September, North Korea conducted its sixth nuclear explosive test despite international condemnation, and has promised to carry out another test in the Pacific Ocean. At a speech to the UN later that month, Mr Trump threatened to annihilate North Korea, saying the country's leader, Kim Jong-un," is on a suicide mission". In exchange, Mr Kim in a rare statement, vowed to "tame the mentally deranged US dotard with fire".